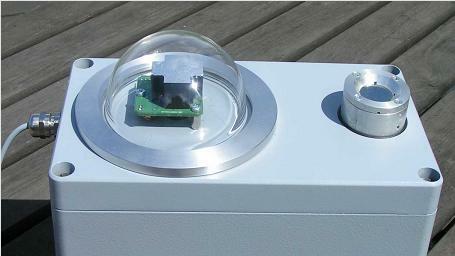 This innovation makes it possible to get automatic observations of the Cloud Cover Factor, CCF 24 hours a day. It consists of a day time unit that observes the sky in 4 directions in parts of the solar spectrum, a night time unit that observes the sky in the thermal infra red spectrum. A microcomputer evaluates the signals and controls the output. Real time data from a PCCD located in Göteborg, Sweden can be seen here. Output: Analog 0 to 1V, for CCF 0 to 100%.